Today it is hard to believe that a railway once ran by the secluded banks of the Cairn water, which flows between the village of Moniaive and Dumfries. But the Cairn Valley Light Railway did exist, although like many other rural branches it was short lived, opening in 1905 and closing barely 45 years later in the face of competition from the motor bus, car and lorry. The terminus of the Line, Moniaive, is certainly an appealing place. A trim village on the old main road from Galloway to Edinburgh, its narrow streets of rose-fronted cottages and the surrounding countryside of rolling hills and tumbling burns have always proved inviting to visitors. Yet it would stretch even the most fertile imagination to consider that a railway would ever have been viable in such a quiet out-of-the-way spot along such a sparsely populated route. The Cairn Valley line was one of the last to be built by the Glasgow and South Western Railway. 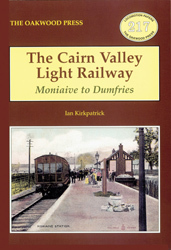 However, the reason why the little branch to Moniaive ever existed was not some vision of a bright new age, but rather a late result of the ‘railway mania’ of the Victorian period when a rail connection was considered essential to ensure the economic and physical growth of any self-respecting town or village. The full story of the line is told here. A5 format, 96 pages, 84 photographs / plans etc.